Material: All Materials Used in this filter Meet the Requirements of European Union's standards of Environ Ment Protection-ROHS(Restrictions on Hazardous Substance). 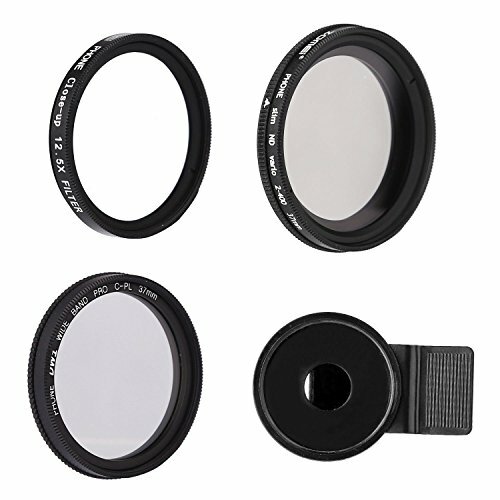 Usage: with the 37mm thread clip, different camera lens filters fit for your iphone, Samsung, sony and other smartphones. 3 in 1 kit lens clip-on lens kit: ND filter + CPL filter + Close Up Filter. You can take creative photos simply with your cellphone. All Materials Used in this filter Meet the Requirements of European Union's standards of Environ Ment Protection-ROHS. This camera lens kits is small and portable, very easy to be taken. New design universal clip can attach any 37MM thread Pro Lens on your mobile, it means you can use it on iPhone, HTC, Samsung, Sony and most smartphones. You can select the intensity from ND2 (1 f-stop) to ND400 (8+ f-stops) by rotating the front ring via ND filter. Polarization rate up to 99.9% and transmittance up to 99.7%.With close up lenses you can come closer to your object without actually coming closer to the object and you enjoy the closest possible image of your choice. View More In Lens Supports.